These elegant chandeliers by Carolina Fontoura Alzaga are actually made of bike components. Repurposing is something we believe in. Stop in and ask to see our Moss lamps! O’Clock is a minimalist design created by Los Angeles-based design firm Okum Made. The aesthetic of the clock is ostensibly hidden behind a beautifully molded piece of wood that is CNC machined. The tooling technique utilizes a bowl nosed tool to sculpt the inside structure. The woods that are currently being offered include American Walnut, Hard White Maple, Douglas Fir, and Cork. We love how each wood adds a totally fresh character. The employees of some of our favorite factories tend to take vacations this time of year. That means orders placed now will be here for the holiday season. 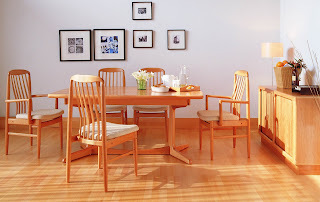 And right now during our Thanksgiving in July Dining Sale, you’ll save on almost all our dining room furniture. Stop in and browse our collection of the world’s best designed and highest quality modern and contemporary dining furniture. Giha Woo is a Korean product designer whose clip and pen caught our eye because — well — sometimes two things are better as one. PS: Carl is obsessed with pens! This wine rack is made of steel and holds up to a half case of wine. The fluid shape appears to be molded by the wine bottles themselves. Celebrated Italian architect Renzo Piano, of the Renzo Piano Building Workshop (RPBW) designed a tiny cabin on the Vitra Campus called Diogene. The structure is very much built as a retreat and one that could function in various climates. It supplies its own power with photovoltaic cells and solar modules, and the needed water is collected in a rainwater tank, and cleaned and reused. The house is meant to provide you with what you need and nothing more, and that’s just what it does. The front space is the living room with a pullout sofa on one side and a folding table on the other underneath the window. Behind the partition is a shower and a toilet, along with a kitchen. We want one! UK-based designer Dan Hoolahan has shown us that even the most mundane of things can get a beautiful makeover. Mobe is a new style of hanger made from bent birch plywood that loops around almost like an infinity symbol, creating two separate hanging spaces perfect for scarves, belts and ties. BSG BIKES was born from two French designers, Thierry Boltz and Claude Saos of Boltz & Saos, and their love of bicycling, which happens to be their daily mode of transportation. Composed of an ash wood frame and steel components, these WOOD.b urban bicycles will most definitely stand out from the pack. Each frame is made of ash plywood that gives the bike an architectural structure for the steel parts to be added. All of the mechanical elements are standard parts from the bicycling industry so they can be maintained and repaired at any bicycle shop. You can even choose the finish of the wood and color of the stainless steel parts to personalize the bicycle. So cool! My wife Vanessa loves these ultra-modern bird feeders by sculptor Joe Papendick. 67 Inc set out to cram all of their passions into one discipline and the idea for the A to Z prints was born. Each print features letters A through Z and numbers 1 through 9, made up to look like 60′s or 70′s trading cards, and covering everything from iconic designs to movie classics to famous footballers. The brightly colored and beautifully curated picks are done in a stylized fashion giving them each a pop culture-y look. It's hot out. It's cool in here. Why not stop by and relax before the festivities begin. We have lots of new looks and fabulous modern and contemporary designs that make for a great way to kill am hour or two. Who knows, maybe you'll find something that sparks your imagination!